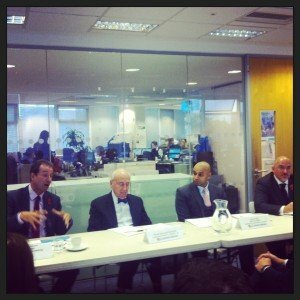 This post represents a summary of some of the key points made at the Conservatives Business Relations breakfast panel discussion and Q&A session held at the party’s Millbank HQ on Thursday with an audience of entrepreneurs. The event was organised by David Beal who operates the @ToryBusiness Twitter account. d) Peter Littlewood, Chairman, Bulldog Skincare for Men. Lord Young started off by talking about how the government Startup Loans scheme has been a big success with 10,000 businesses already receiving loans this year, while the government has the ambitious aim of issuing 40,000 loans to startups next year. In my experience this initiative seems to already have had quite an impact in helping to generate more of a culture of entrepreneurship. Lord Young was amusingly scathing about business schools, inferring that in the current format they are a waste of time, teaching academic nonsense and effectively being guilty of mis-selling courses that are of no real practical relevance for starting a business. Lord Young believes that secondary schools need to teach general business skills like tax, accounting and finance so that school leavers have more of an understanding of the real world and are more likely to see starting their own business as a viable option. Nadhim Zahawi talked about his experience of founding YouGov before entering Parliament, a business that now employs 850 people around the world. To murmurs of agreement from the audience, Nadhim said that the only thing he wanted from government as an entrepreneur was for it to get out of the way! He was thankful for the Enterprise Investment Scheme tax breaks that had been instrumental in helping YouGov attract an angel investor in its early days. Nadhim sang the praises of the government’s current policy of allowing employers to automatically avoid having to pay the first £2,000 of employer’s national insurance for each new employee they take on without having to fill in any paperwork. The panel discussed how the UK is undergoing a huge transformation in the amount of private sector companies being created with the rate of small business creation increasing all the time. Over 90% of companies now have less than 10 employees, while Lord Young commented that things were very different back in the 1970s when there were far fewer SMEs and entrepreneurs. Nadhim and Lord Young mentioned how the government is planning to tackle the increasing problem of larger corporates not paying invoices in good time by introducing statutory regulation to encourage prompt settlement. Peter Littlewood talked about his business background and how after 25 years with big brands like Mars and Allied Domecq he decided to back two 27 year olds who started the Bulldog skincare brand for men in 2006. He has been chairman since and taking advantage of modern practices and technologies the business now competes with the Unilevers of the world, although with a staff of just 6 people and a turnover of £6 million. Peter said that UKTI were particularly helpful in assisting Bulldog’s expansion abroad, although cautioned that you first need to build something in the UK and then carefully choose the overseas markets to target, while Lord Young warned that participating in trade missions can be very expensive but not lead to any tangible benefits. Nadhim added that the UK’s embassies are also very useful for helping to set up meetings and events abroad and getting the support of foreign governments when required. Questions were then opened up to the audience with Marcus Warry first asking what could be done to reduce business rates, a pernicious tax that really harms the high street and small businesses. Unfortunately the response couldn’t have been any more negative with Lord Young explaining that as the tax gets paid to local authorities it would be very difficult for central government to change things, particularly as it raises over £20 billion for the exchequer which would be too much of an ask for government to find elsewhere. The next question concerned principles based regulation and the view was that it is damaging business by creating too much uncertainty and increasing the time companies have to deal with compliance issues. As an aside Lord Young blamed his Liberal Democrat coalition partners for not being able to reform employment law and make it more entrepreneur friendly. The panel then argued that it was better for laws not to be too prescriptive so as to create a tick box culture. However, my experience of the Solicitors Regulation Authority’s ‘outcomes focused’ regulation is that such principles based regulation gives too much discretion to the regulator. The uncertainty giving them more power to interpret things in their favour and producing greater fear in their subjects who waste more time with compliance because the uncertainty leads to a ‘better safe than sorry’ approach. Lord Young talked about how HMRC has trouble collecting revenue, particularly from larger companies, and that the government are looking to implement new laws to increase tax and minimise the opportunities for avoidance. My view is that surely politicians who are pro business should be trying to look at ways of helping small businesses pay as little tax as larger corporates. Increasing taxation only ever leads to more waste, regulation and restricted opportunities for individuals to trade and generate wealth. The next topic dealt with was tendering for public sector work and the need to open up procurement for SMEs by simplifying the bureaucratic application process. The panel agreed that at the moment big contractors like Serco game the system by being large enough to cope with the administrative overload, while if more work went to smaller businesses there would be far less waste and much bigger savings for government. The government ministers confirmed that they are looking to minimise the pre qualification questionnaires and produce a site where contractors can register their details just once, rather than continually making separate applications all the time. Finally, the discussion turned to Europe and the EU. Lord Young empathised with the frustrations of businesses and said if you lock so many hundreds of unaccountable officials in a room for a year they will proficiently come up with reams of new regulations. As a result of such massive over regulation the panel and audience agreed that Europe is rapidly going downhill. Ed Head mentioned that his family’s chemical engineering company were now looking to acquire overseas producing units as it was now too expensive and difficult to manufacture in the UK due to EC regulations. Peter Littlewood said that compliance takes up a disproportionate amount of time for Bulldog and doesn’t add any value to the business. He said it was now easier and preferable to export his products to Australia rather than the EU, while the panel agreed that in reality the European ‘single market’ is a fallacy as there are so many different barriers to trading with constituent nation states in addition to the overall EC regulatory burden. Nadhim Zahawi closed by saying that Germany is desperate to keep the UK in Europe so as to to help counter the socialist tendencies of France and other states and make the EU more competitive. However, he said that the outlook for the EU does not look good as its centralising nature and need to achieve consensus on everything will continue to suffocate the EU economies, while really UK businesses should be looking a lot more to the Commonwealth and other overseas markets in order to more easily sell their products and achieve growth. I have worked with Jonathan on a number of varied elements of my businesses over the years. He has always been very responsive and insightful to every question I have had which has allowed me to make the best decisions possible. Jonathan has a dynamic understanding of modern business, which goes hand in hand with his good judgment and he will always be our first port of call when we need guidance in the legal field.